I love spring. As a matter of fact, I love both transitional seasons; spring and fall. I only wish they lasted longer before the intense heat or cold sets in. In the spring all of creation erupts into song. The birds begin a new season of nest building and family growing. Nature awakens from the long winter sleep and flowers begin to pop up all over the place. 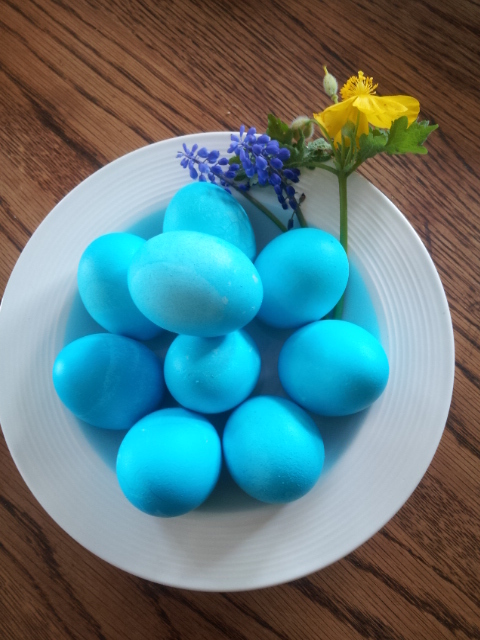 For me and our family, spring means Easter. And Easter means lamb. For years we celebrated the feast with baked ham like many others until one year, back in 1993 if I’m correct, I received my monthly Bon Appetite magazine. 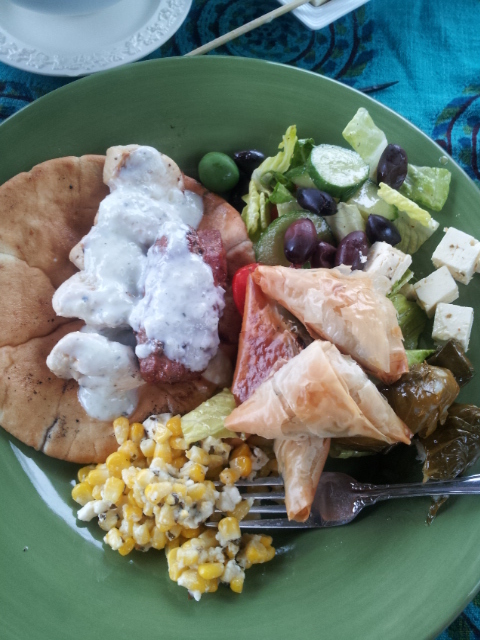 In it was a Greek Easter feast that I simply HAD to try. 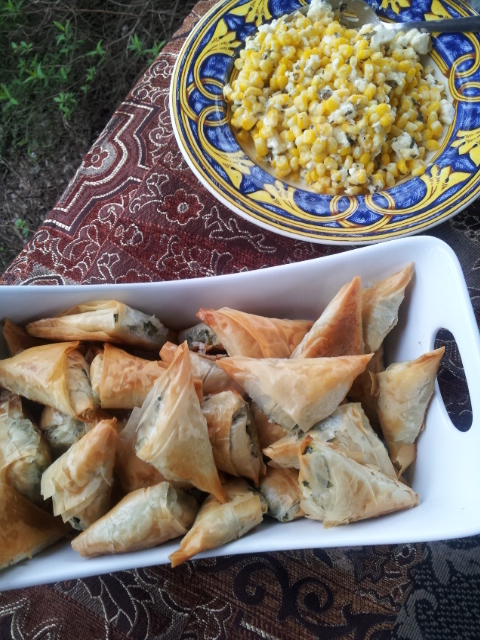 I used every single recipe for the meal and even added a Martha Stewart recipe for Spanakopita instead of just purchasing them at the store. 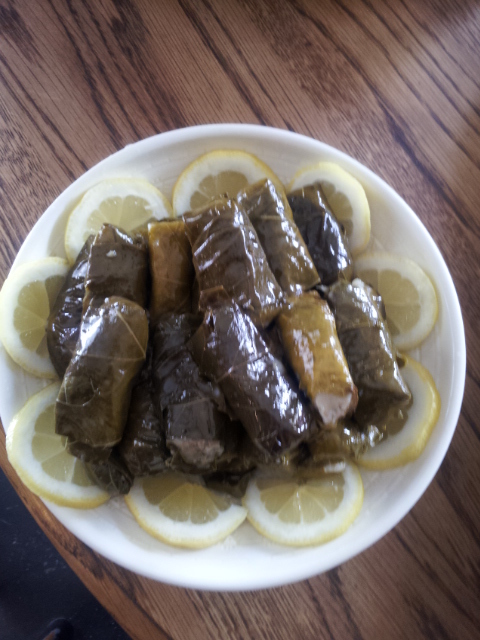 I looked up a recipe for stuffed grape leaves instead of purchasing them also. Boy what a feast it was that year! We began with the lamb and lemon soup, followed by roasted leg of lamb, the three different varieties of Spanakopita, salad and an assortment of breads, pita, Kalamata olives and cheeses. We completed the meal with coffee, strawberries and delicate almond cookies. It was a perfect feast! I only wish we had invited more people, we had so much food! These days, we keep the Greek theme for Easter because we love Mediterranean food and we love lamb, but it has evolved into a much more casual meal. We still make everything from scratch and we still make way too much food! For the most part, it’s become a feast that is consumed with our hands; utensils aren’t required but certainly aren’t prohibited! We’ve even taken to having this feast alfresco so it works with the more casual atmosphere we’ve adopted. This year our menu was pretty much the same as last year. Hey if it was great then, why change it? The menu consisted of: Ground lamb which I made into sausages, grilled chicken Kebabs that were marinated in lemon vinaigrette, Greek salad, corn with feta and mint, Dolmades (stuffed grape leaves), assorted olives with marinated feta cheese, and of course fresh pita bread and Tzaziki sauce. Yes it seems like a lot of work but we do it once a year and really, it’s so worth it! That’s the point; do things you love with those you love and it’s all worth it. It takes effort to plan and execute a meal, but it’s not difficult. We will do things for love that we will never do for duty and if we think of family gatherings as only a duty, they will not be fun for us, or those attending. I take the time to tell you all the stuff we do, not to provoke you to jealously or even to show off our wonderful feast. No, I do this because I want you to get a passion for gathering around the table; be it with family or friends. It’s a big deal. What we are passionate about, we want to do. So stir up those passions for food, for family and for amazing conversations! It will happen. Well dang Gigi….You soooo make me want to visit your place over Easter. Wonderful post. Easter would be awesome! But really, anytime would be great. And, thanks! Wonderful post & great food Ginny. I love Mediterranean food as well. Spring has arrived here in Nashville. Fruit trees are in flower and the early spring bulbs are already poking up their heads. Did I tell you I love spring? Well, I do. Easter is just under 3 weeks away so I wanted to repost this from last year. Maybe it will encourage you to gather around the table with family and friends alike and have wonderful conversations!